Clara is Alex's deceased mother. During Alex's eight heart event, he states that she died 12 years ago, some time in the summer. When she died, Alex had to move in with his grandparents, George and Evelyn, who were Clara's parents. During Alex's memory of her, Clara is seen holding Alex as a baby and singing to him. She has brown hair, with two blue hair bands, and is wearing a purple shirt. 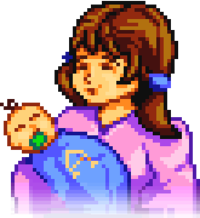 In the memory, Alex is wrapped in a blue blanket with the letter "A" sewn on it, and has a green pacifier in his mouth. Her relationship with Alex's father is assumed to have been strained, since Alex describes him as being either absent or drunk. In Penny's Two Heart event, Penny speaks to George, calling him "Mr. Mullner." Secret Note #5 refers to George as "Mr. Mullner." Secret Note #12 refers to George and Evelyn's home as "The Mullners'." On the nightstand in George and Evelyn's bedroom, there is a letter from Clara. If you're reading this, it means I've passed on. I'm so sorry you had to go through this. Know that I love you both. Don't be too upset, I'm with Yoba now. My final request: take care of Alex. He needs a family, something stable. He's a good kid. 1.3: Added Secret Notes with references to the name "Mullner". This page was last modified on 28 August 2018, at 19:50.